Military documents belonging to Thomas P. "Boston" Corbett, the man who killed John Wilkes Booth following President Lincoln's assassination. Corbett enlisted as a Union soldier in New York during the Civil War. 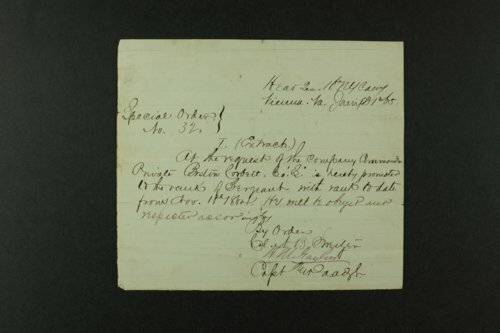 These documents include Corbett's promotion to sergeant following five months spent at Andersonville Prison in 1864. Also included is a subpoena for the trial of Henry Wirz, commander of the Andersonville Prison, who was later executed for conspiracy and murder, and a subpeona for the trial of David E. Herold, an accomplice of John Wilkes Booth, who was also later executed. Copies of muster rolls for Company I of the 12th New York State Militia and Company L of the 16th Regiment of the New York Cavalry were included with the documents.